Media and Contents: 152 parts in olive green plastic, another 34 parts in black plastic (the link and length tracks) one photo-etched fret, waterslide decals and vinyl stickers. 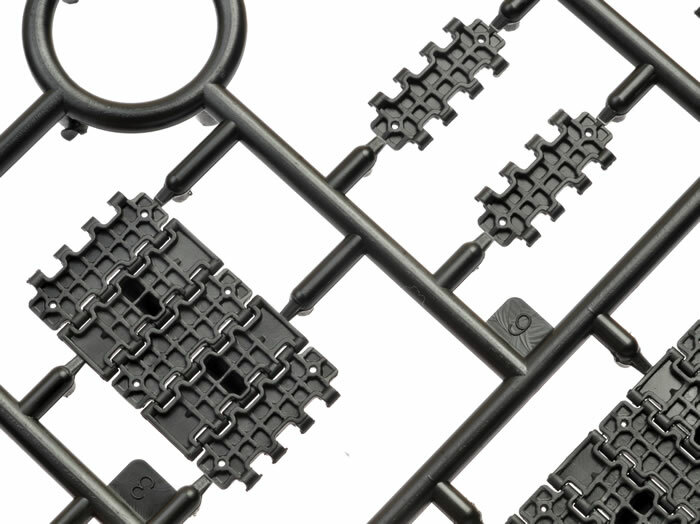 Advantages: High level of moulding; small parts count for a fast build; decent level of detail; link and length tracks; first mainstream military release in this scale for many years. 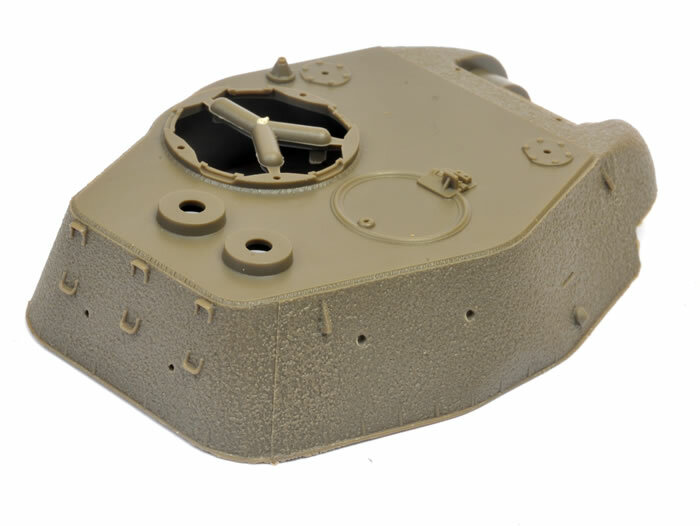 Disadvantages: All crew hatches moulded shut; solid green plastic headlight lens; ejector pin marks on inner surfaces of tracks. 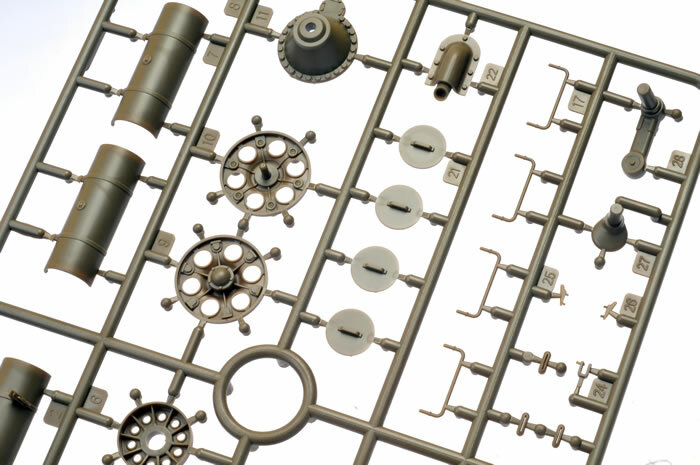 Recommendation: Grab this one to accompany your 1/32 scale soldiers or as a joint project to build with your kids. No folks, it's not a typo. 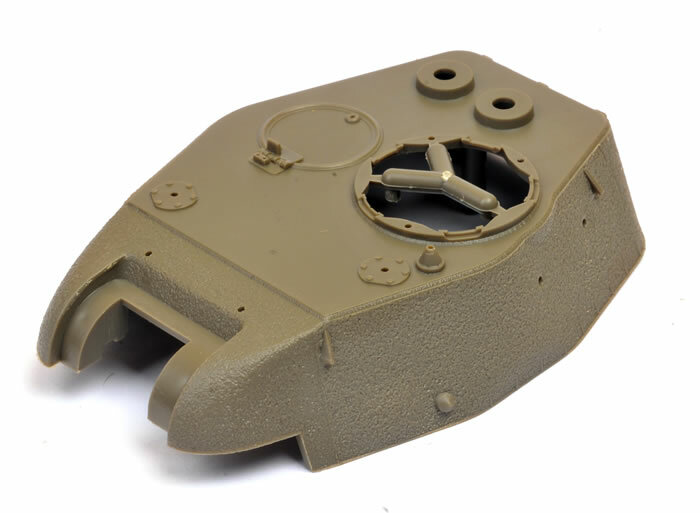 Bronco has released a T-34/85 Medium Tank in 1/32 scale. 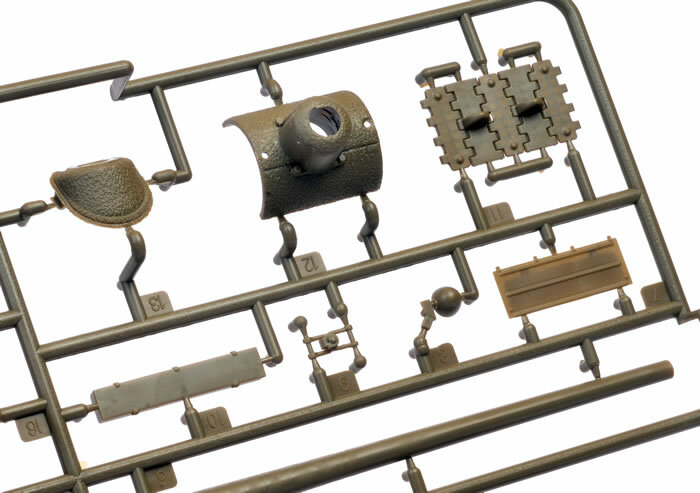 Airfix and Monogram each released a range of military vehicles in this scale during the 1970s but, ignoring sporadic re-releases, this is the first new tool military kit in 1/32 scale that I am aware of since then. 1/32 is a popular scale for vinyl and metal toy soldiers, and I assume that that Bronco's new release is designed to appeal to this market. 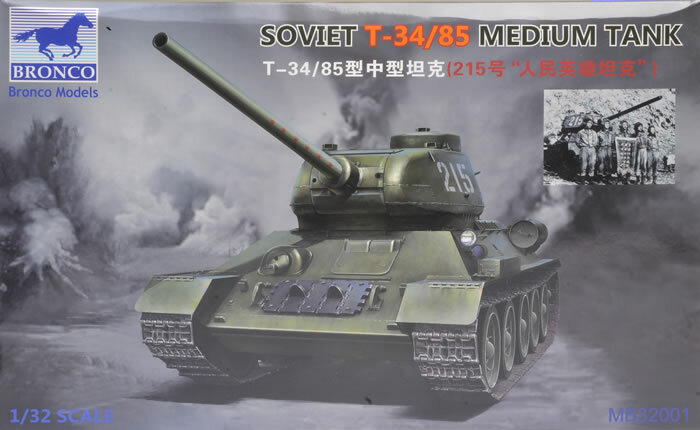 The kit seems to best represent a North Korean Model 1945 T-34/85, with its angled flat front mudguards, "spider" wheels, rear-mounted smoke dischargers, cupola "lip" on the upper turret side, twinned turret ventilator and the bulge on the lower side of the turret to accommodate the powered traverse. The main inconsistent feature is the split Commander's hatch, which I believe was replaced with a single flap hatch on the Model 1945. The model takes a strikingly different approach than Bronco's usual kit releases. This new 1/32 scale T-34/85 is made up from just 152 parts in olive green plastic, another 34 parts in black plastic (the link and length tracks) one photo-etched fret, waterslide decals and vinyl stickers. 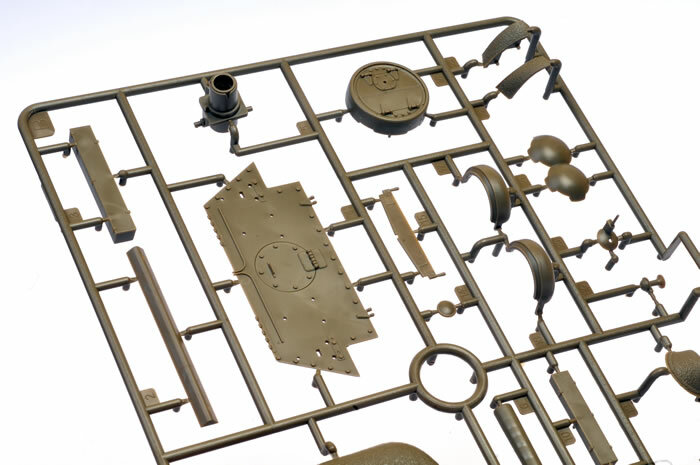 Compare this to Bronco's 2014 1/35 scale KV-85 kit, which had more than 1,000 plastic parts. So, what does a four-fifths reduction in parts count deliver to the modeller? Well, a really fast build for a start. 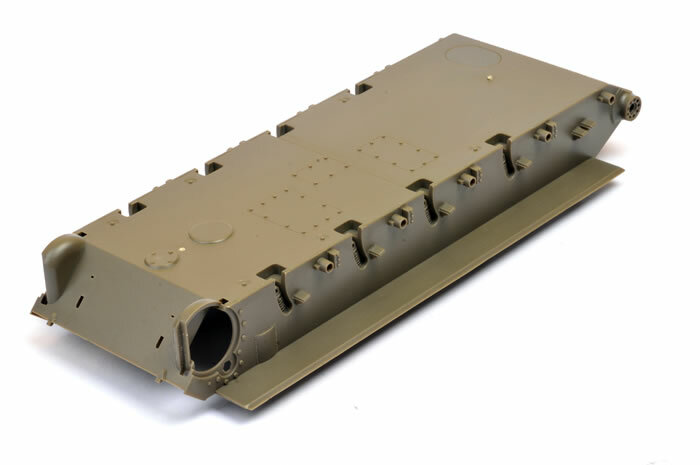 The upper and lower hulls are moulded as one piece each. 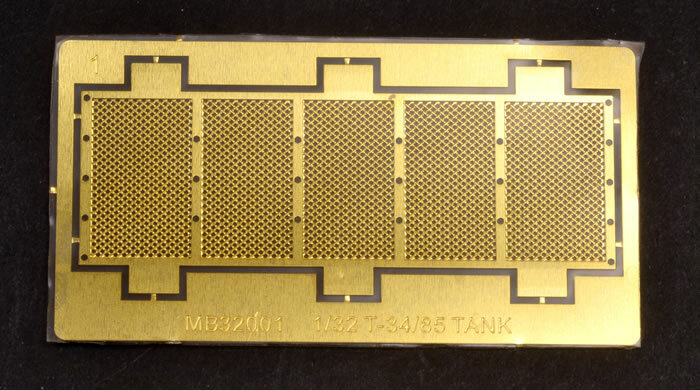 The driver's hatch is moulded shut but, surprisingly, a photo-etched part is supplied as see-through engine mesh. 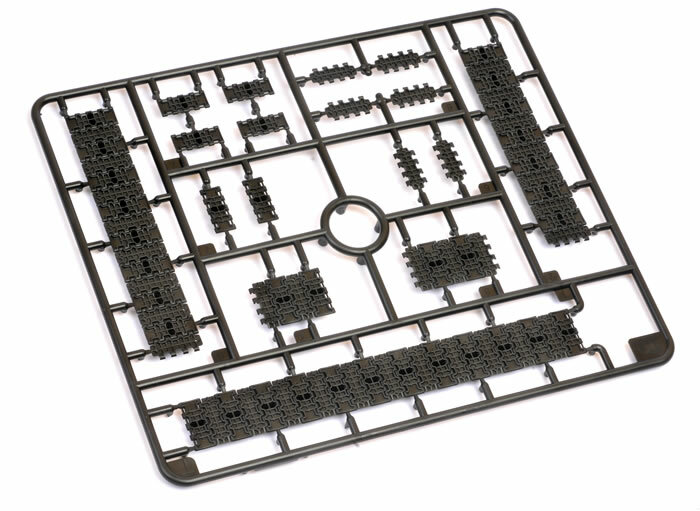 Correct alignment is ensured with holes on the photo-etched mesh mounting injection-moulded bolts on the frame. Nice. Running gear is simple. Swing arms are separate parts keyed by two locating pins. The road wheels are supplied as inner and outer halves with a separate hub cap. The drive sprocket is secured with a plastic sleeve inside the final drive housing (Parts C1). With very careful application of glue the sprockets should remain moveable, which will be helpful for lining up the tracks' guide teeth. The idler wheel track tensioners (Parts C27) are separate parts too. I'd recommend leaving these loose until the tracks are in place just in case the tracks are a little loose or too tight. 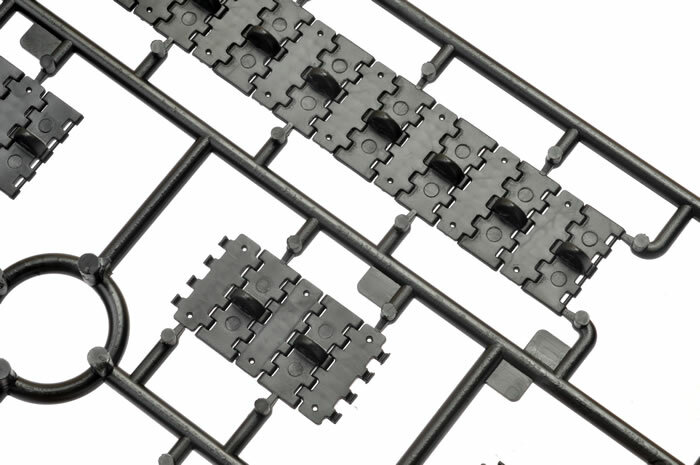 The link and length tracks are made up from just 17 black plastic parts per side, with two lengths for the upper run, one for the lower run, individual links to run around the drive sprocket and idler wheel with a couple of short lengths to complete the loop. Track detail is really impressive with nice deep holes over the guide horns and visible distance between the links, but there are two large ejector pin circles on the inner surface of every second link. I don't usually get terribly upset about ejector pin parks on the inside of tracks as you won't see much when the model is finished, but these are pretty prominent. Hull fittings presented as separate parts include handrails, stowage boxes, the saw, four fuel drums, headlight and horn, spare track links on the glacis and tow hooks. The headlight lens is solid green plastic but it is a separate part so you can replace it with a clear aftermarket lens if you wish. Smaller details such as tie-downs and hinges are moulded in place. Smoke discharger drums are also provided for the rear hull and rows of grousers on the track guards. 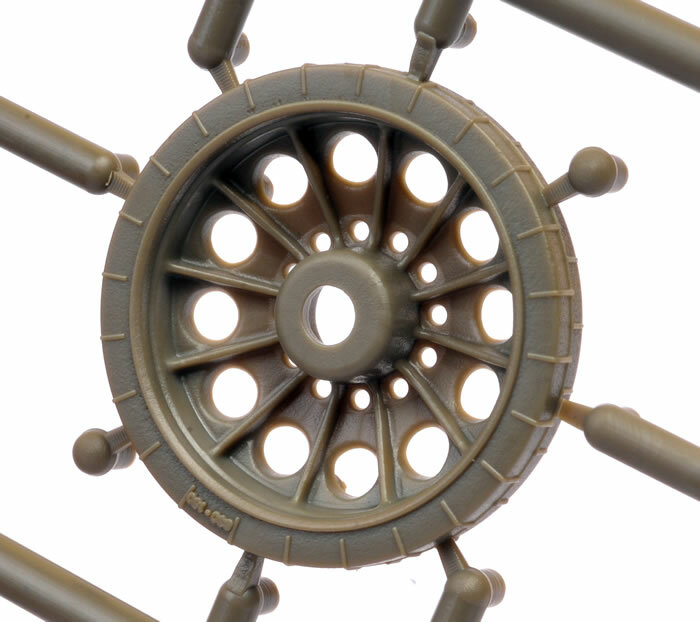 The turret is moulded with rough cast texture but it is a little uniform for my taste. I would probably rough and randomise the texture with putty. 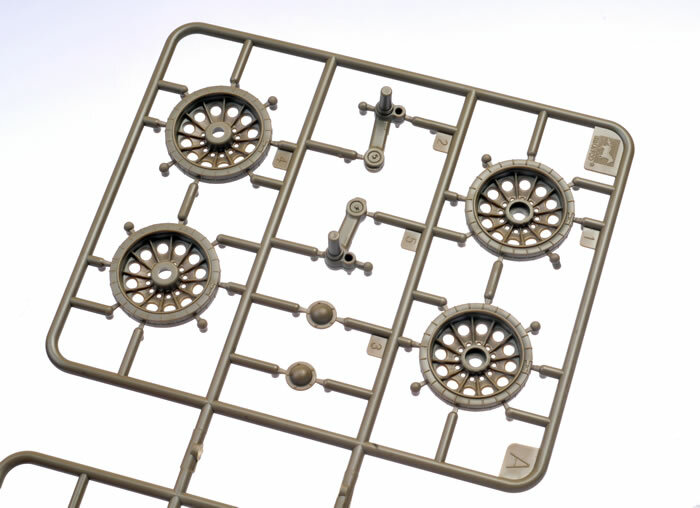 Crude lifting hooks are also moulded in place, but the instructions advise the modeller to cut these off and replace them with subtler representations offered on the sprues. 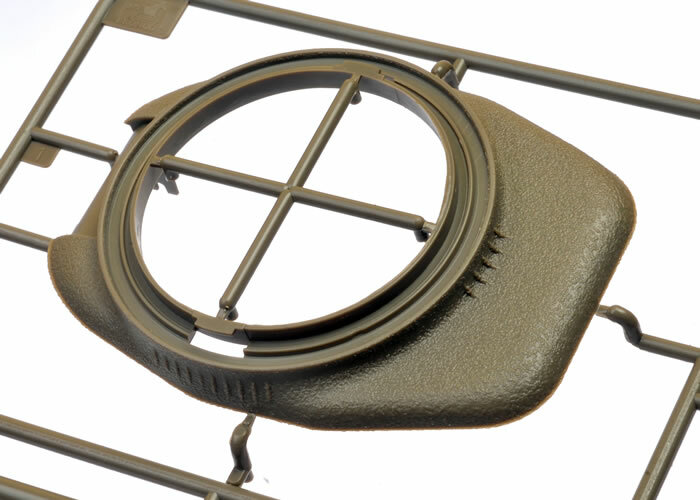 The main cupola part is moulded with the Commander's hatch closed. 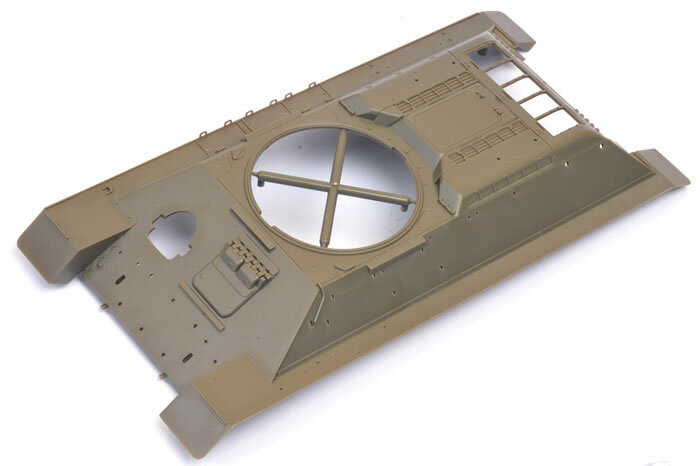 This is disappointing, and a bit confusing as Bronco has supplied small separate vision slot parts to add to the cupola. 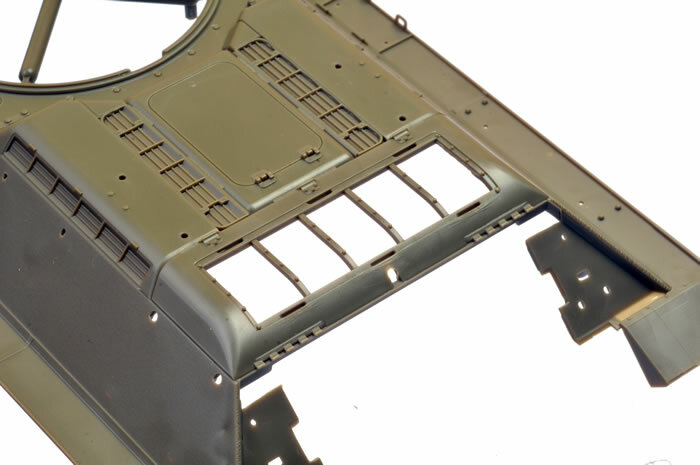 Surely separate hatch parts would not have added to the complexity of the model. The loader's hatch is moulded shut too. 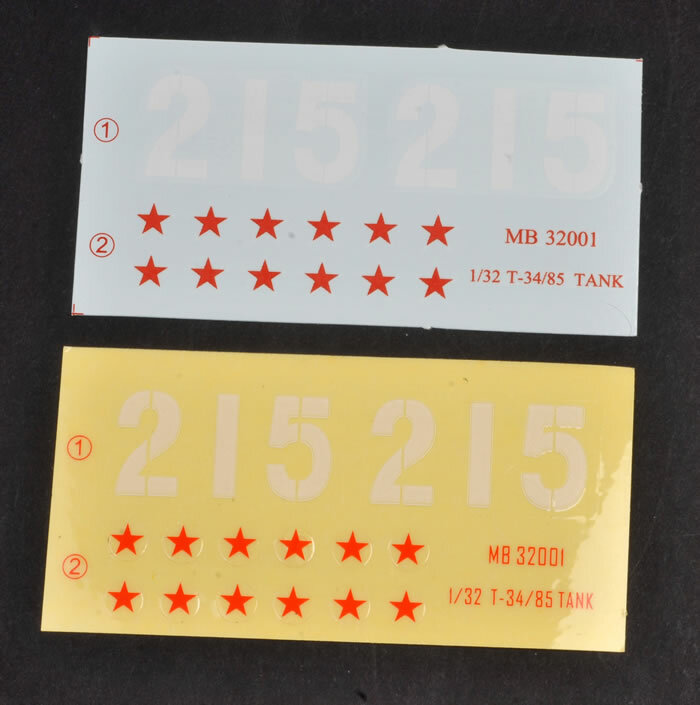 Conventional waterslide decals are supplied for one vehicle plus six red star kill marks for the barrel. Perhaps the most telling clue to the intended audience for this model is the inclusion of a set of vinyl stickers with the same markings as the decals. This is a curious kit. 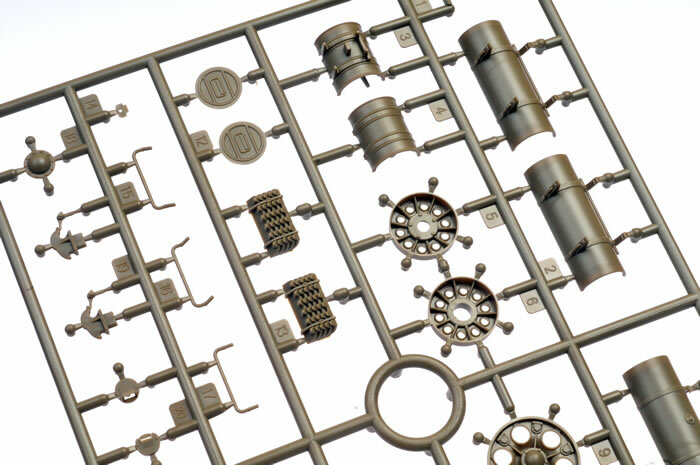 Its scale will appeal to toy soldier hobbyists and the relatively small parts count will make it suitable for younger and less experienced modellers. Assembly looks pretty straightforward although there are a number of small separate pieces and the link-and-length tracks may present a challenge to the absolute beginner. 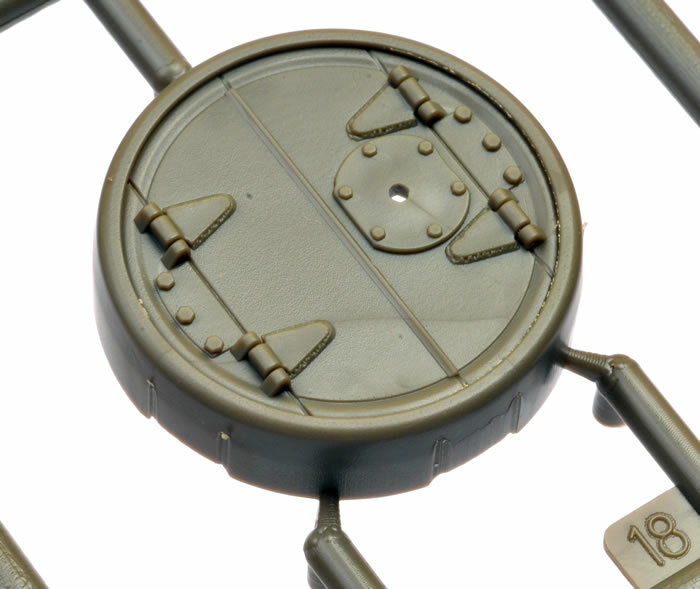 I think the kit would have been better served with at least the Commander's hatch being a separate part, and the ejector pin circles on the inside surfaces of the tracks will irritate some modellers. I also think that Bronco should differentiate this kit from their usual 1,000+ part uber-kits with a different style of box art and clearer indication of the scale. Having said that though, the shapes look good and there are surprisingly few accuracy or detail compromises considering the low parts count. I do like the concept of a generally accurate and easy to build series of military kits. Grab this one to accompany your 1/32 scale soldiers or as a joint project to build with your kids.